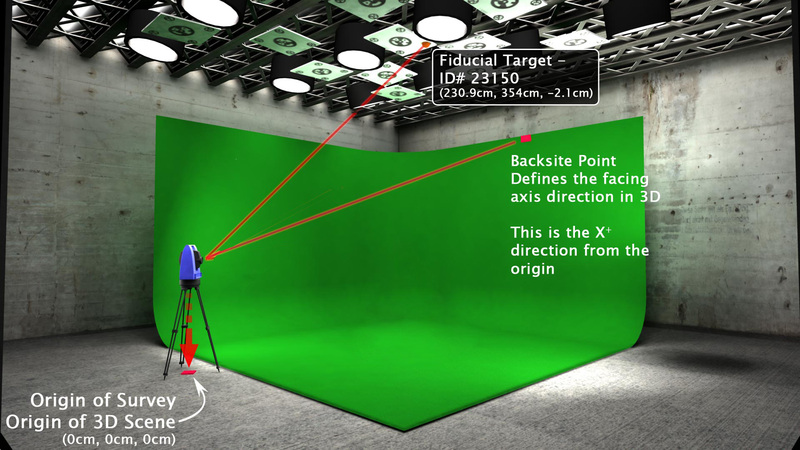 It’s not uncommon in virtual productions to use high accuracy measuring tools like LIDAR or Survey guns. 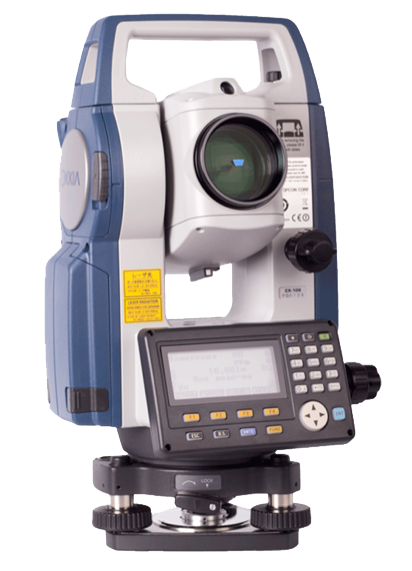 The Total Station or Survey Gun functions like a laser tape measure, but with points measured in three axes: Northing, Easting and Elevation, or XZY. For accurate real time tracking, Previzion utilizes data from the Intersense IS1200 VisTracker. The IS1200 sensor uses fiducial markers that are used to reference the position of the camera in 3D space. For this to happen, the position of each of the fiducial markers (or targets) needs to be measured with a Survey Gun. At the center of each target, there is a tiny little cross in the optical center of the target. This cross is what we need to measure with the Survey Gun. The measurement of all of the targets’ centers are then exported from the Survey Gun to Previzion through a Constellation File. 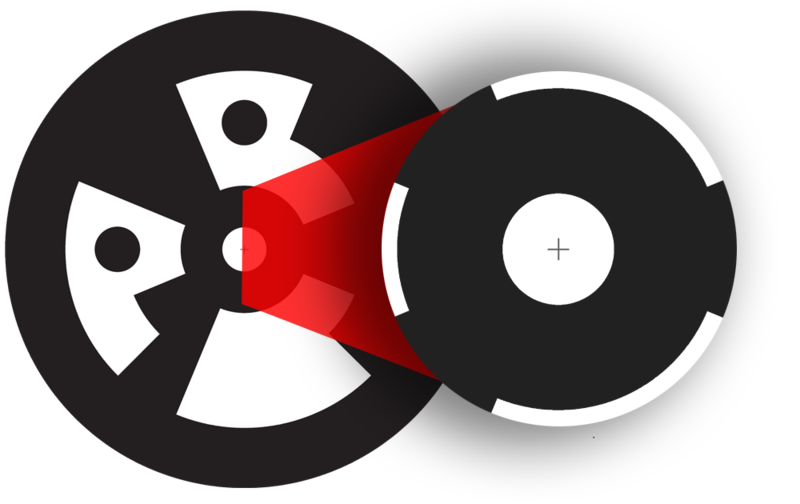 Nearly all post production tools in the 3D computer graphics world are based around a 0,0,0 origin as the center of the ‘world’. The reason for this is straightforward; since a computer has a limited number of bits to represent a number, one can get into strange numerical errors when one uses very large positive or negative numbers to do all of the transformations that computer graphics requires. It is common practice in surveying to start off with a very large positive number, to avoid having any negative values in the survey. However, as can be guessed, this conflicts with the practice needed in computer graphics. We explain more about coordinate systems in Coordinate System – Cartesian Model. Since Previzion is a 3D computer graphics system, and both sends and receives 3D data from other post production computer graphics systems, its world is also based around a 0,0,0 center. The recommended practice is to specify some point relatively near the camera to be 0,0,0, and to point the +X axis away from the camera and the +Z axis to the right of the camera. When using a Total Station, or Survey Gun, it’s important to remember that this is a tool used professionally by many contractors, land surveyors and architects to measure landscape, terrain, constructions and buildings. Origin Must be within the Sound Stage – when surveying land or terrain, it’s always easier to work with large numbers so you never encounter negative values. However, this is not the case in surveying for VFX. In VFX, we want to have positive and negative numbers. We need the Origin, the point where all axis are measured from (x=0, y=0 and z=0) to be literally within reach. Origin must be a physical place within the stage. We often place the origin in the middle of the sound stage and mark it with a nail or sticker. Elevation 0.000, must be on the floor height – because there is rarely a slope on the floor of sound stages, it’s very convenient and easy to make the floor be Elevation = 0.000 m.
Backsight should be perpendicular and directly in front of the camera – to make sure that the front of the camera is the forward axis in the survey, make sure that the backsight (the heading) of the survey is directly in front of the camera perpendicular to the green screen or green cyclorama. Output file should be simple CSV with Northing, Easting, Elevation, Description – there are many ways to write down or export surveyed points from total stations. For the purposes of Previzion, what we need is just a simple text file (.txt) that contains all points, in meters, as Northing, Easting, Elevation and Description. Whenever working with professional surveyors, it’s very important to point out these differences.